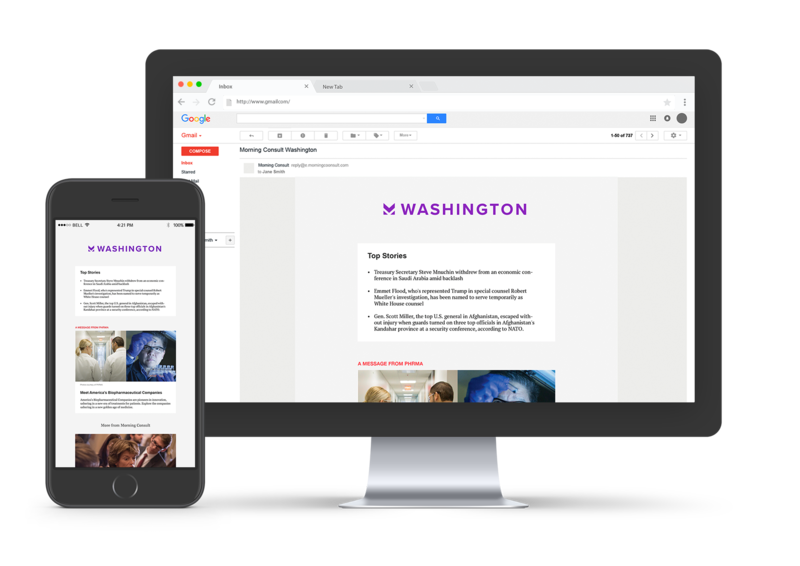 Get the Brands briefing to receive more data, news and insights like this. *By submitting this form, you are opting in to receive communications from Morning Consult. Screenshot from Gillette's "Is this the best a man can get" ad. 61% of U.S. adults viewed Gillette’s ad favorably vs. 17% who didn’t. 48% of Republicans liked the ad vs. 26% who didn’t. A new online advertisement from razor and shaving supply company Gillette tackling gender issues is working up a lather on social media. 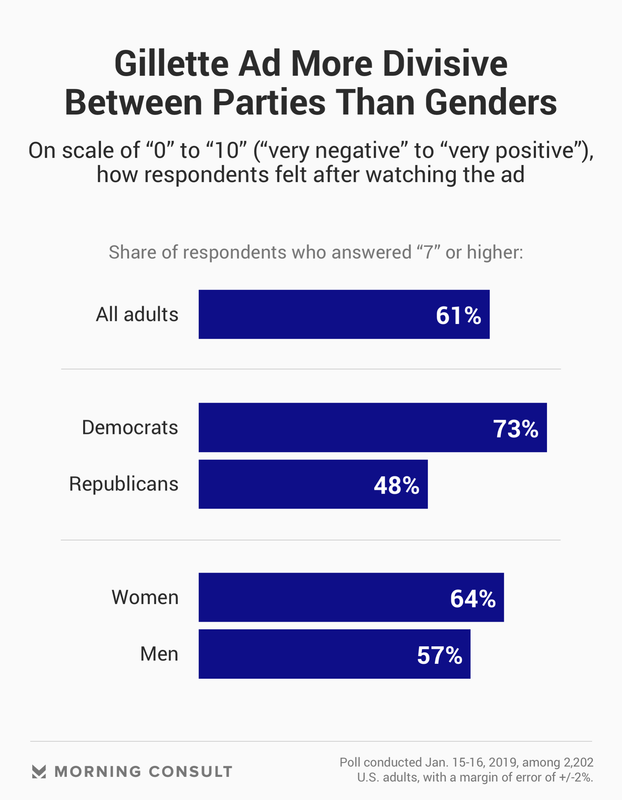 But the ad resonates well with most viewers, a new Morning Consult analysis finds, and the most divisive attitudes are not gender-based but political. Respondents were asked to indicate in real-time whether they had a favorable or unfavorable view of the video they were watching. The lines display viewer sentiment as the video plays. The ad spotlights certain aspects of behavior sometimes exhibited by men, such as boorishness, mansplaining, bullying and sexual harassment and assault and asks, “Is this the best a man can get?” a twist on Gillette’s 30-year-old slogan. The spot, released ahead of the Super Bowl, calls on men to hold one another accountable for how they behave and to serve as good role models for the young men and boys in their lives. Social media blew up following the ad’s release. Many applauded The Procter & Gamble Co. brand for tackling elements of “toxic masculinity.” Others, such as media personality Piers Morgan, took the ad, which has been viewed nearly 17 million times on YouTube in four days, as an affront to manhood in general. Some social media users, mostly men, posted pictures of their Gillette razors in a toilet or the trash. But a Morning Consult dial test of the ad showed that the most polarizing attitudes about the spot broke along political lines, not gender. Sixty-one percent of adults gave the ad high marks on how the video made them feel — 7 or more on a scale of 10, with “0” as very negative and “10” as very positive. Nearly three-quarters (73 percent) of Democrats scored the ad 7 or more, compared with 48 percent of Republicans. Among those who strongly approved of President Donald Trump, 44 percent said they enjoyed the nearly two-minute video. Most women (64 percent) and men (57 percent) gave the ad high marks. The Jan. 15-16 survey was conducted among 2,202 U.S. adults with a margin of error of 2 percentage points. The ad’s launch coincides with Gillette’s new website, “The Best Men Can Be”, which details its responsibility to promote “positive, attainable, inclusive and healthy versions of what it means to be a man.” Gillette pledges to donate $1 million every year for the next three years to organizations encouraging men to be their best selves. Gillette’s positioning as a socially responsible and value-based company improved with the spot. Before watching the ad, 42 percent of respondents agreed that the company “shared their values.” That number jumped 29 points to 71 percent after viewing. Attitudes about whether the company is socially responsible (45 percent to 72 percent), values its customers (61 percent to 71 percent) and is a good corporate citizen (47 percent to 68 percent) also increased. Want more data on brands?